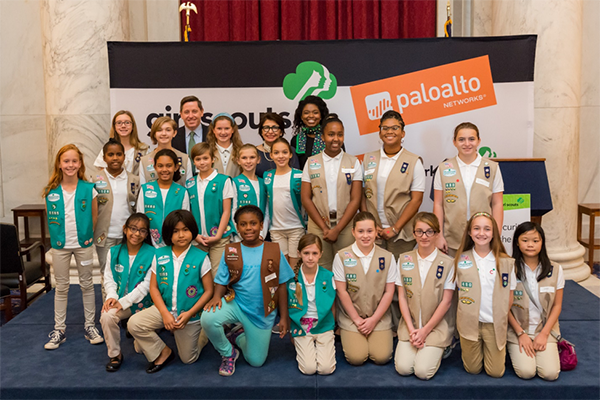 Cybersecurity experts from Palo Alto Networks and Girl Scouts of the USA (GSUSA) joined forces on Capitol Hill yesterday to highlight National Cyber Security Awareness Month (NCSAM) and a shared commitment to building a talent pipeline to tackle tomorrow’s toughest cybersecurity challenges. Co-hosted by a bi-partisan group of members of Congress, the event aimed to inspire the next generation of cybersecurity professionals, and encourage a dialogue between the public and private sectors about how to cultivate a diverse pool of talent. 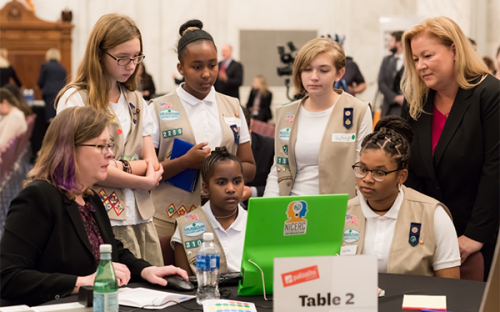 The day began with over 20 Girl Scouts participating in an activity led by our very own cybersecurity experts. Participants created a traceroute map to identify the path that packets of data take to get from a source computer to a destination, and they learned about how cybersecurity professionals can use this process to investigate the details of alleged cybercrimes. Following the activity, U.S. Reps. Debbie Wasserman Schultz (D-FL) and Buddy Carter (R-GA) delivered remarks as part of a panel discussion, along with GSUSA CEO Sylvia Acevedo and me. The panel discussion was led by Girl Scout alumna, Lauren Prox, a Girl Scouts Gold Award winner, who is currently pursuing a degree in industrial engineering at Clemson University. The panel focused on ways in which government and industry might address the cyber workforce gap, and how to make cybersecurity a more alluring career option for young girls. I would like to thank GSUSA and our co-sponsors, Sen. Shelley Moore Capito (R-WV), Sen. Susan Collins (R-ME), Sen. Tammy Duckworth (D-IL), Sen. Jeanne Shaheen (D-NH), Rep. Susan Brooks (R-IN), Rep. Bonnie Watson Coleman (D-NJ), Rep. Cathy McMorris Rodgers (R-WA) and Rep. Debbie Wasserman Schultz (D-FL). Learn more about our partnership with GSUSA. The post The Next Generation of Cybersecurity Experts: A Day on Capitol Hill With GSUSA appeared first on Palo Alto Networks Blog.